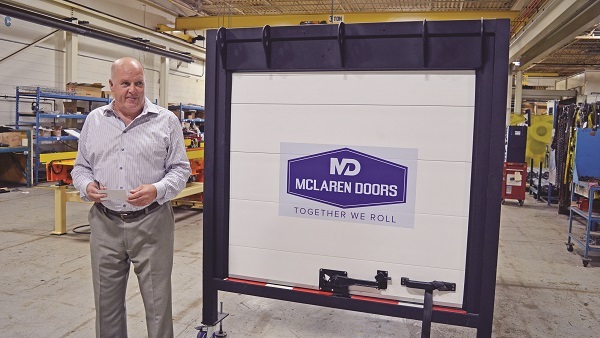 A rebranded local company is looking to revolutionize the trucking industry with a new spin on roll-up doors, making heavy, wooden, gas-guzzling features a thing of the past. After five years under the ownership of Aurora resident Stewart McLaren, RoaDoors announced its rebrand to McLaren Doors on Wednesday afternoon, an unveiling attended by MP Leona Alleslev, Mayor Geoff Dawe, Councillor John Abel, and Sandra Ferri, Executive Director of the Aurora Chamber of Commerce. Mr. McLaren, who also owns the Aurora-based Almac Industrial Systems, which designs and develops material handling and automated systems, said the deal came about after talking with a friend who was also in the business world. “I said, ‘I’m tired of having to re-engineer and design things every day with the risks involved; I wanted to make something that was just repetitive,’” he recalls. “I was out west on a sales call and he phoned me and said, ‘Stu, I invested in this company and it is going under, but they make things that are repetitive and not that complicated. Would you like to get involved?’ I said yes, like a fool! They challenge the standard wooden doors that often swell with moisture and become exceedingly heavy in place. The company prides itself on being able to reduce the weight of the truck doors through the use of PVC, which ultimately helps in reducing gas consumption, lowering emissions and providing a safer environment for drivers.